Jeff Hopkins on Mach Diamonds. Are they what we enthusiasts think they are? Jeff Hopkins of SpaceX shared this with us on our Facebook discussion group. Enjoy! There exists a common view that rocket motors that produce mach diamonds in their exhaust are better engineered / more powerful than those without. This is common in model/amateur rocketry and when people see pictures like the Raptor test burn. Seeing mach diamonds is pretty awesome, and looks very cool, but the reason they exist in the first place is because a pressure mismatch from nozzle exit to atmospheric pressure. This means that the nozzle expansion is inappropriately sized for delivering maximum thrust/efficiency at that pressure (altitude). This does not mean it’s not well engineered, as it does test the motor design, but maximum thrust/efficiency is not achieved. Sometimes this is actually designed in a rocket nozzle so maximum efficiency is reached at a certain altitude/pressure. Rocket motors create a choked flow (at local sonic mach 1), and then expands the flow, but because the mass flow rate must remain constant the exhaust is accelerated to supersonic speeds. 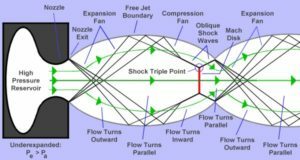 The greatest transfer of kinetic energy occurs when the exhaust pressure is equal to the atmospheric pressure (kind of, dumbing down a little seehttp://www.nakka-rocketry.net/th_nozz.html). This changes based on altitude, hence why vacuum nozzles are so much larger. 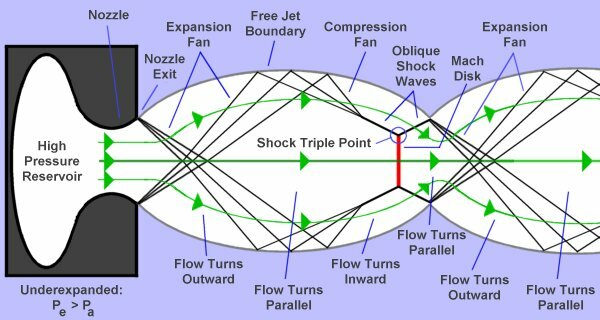 If the nozzle expands too much (over expanded), the exhaust pressure is below ambient, and the plume retracts from the nozzle first (also causing mach diamonds), and in extreme circumstances causes instability in the exhaust where bad things happen. If in a vacuum, pressure is well…. a vacuum, and not prone to having this happen. There are mass trade offs though, so expanding a nozzle indefinitely doesn’t work. But basically, mach diamonds are pretty, but they mean the motor is not running at 100% possible thrust for the given atmospheric conditions. A perfectly expanded nozzle will not contain mach diamonds and deliver the maximum thrust. Very cool though. Because most first stages travel through a rapidly changing pressure through the lower atmosphere, they are usually slightly over expanded at launch. 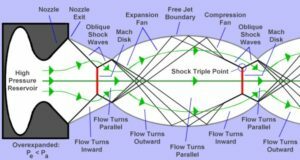 This allows for the efficiency of the motor to be higher through a longer time period of the burn (starting over expanded transitioning to prefect expansion and then to under expanded), at the sacrifice of some thrust and efficiency at launch. Click for a link to the patent on a Stepped Nozzle design.